De Carlini Santas from all over the World have arrived at The Cottage Shop! 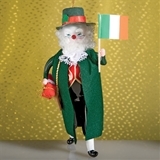 De Carlini Russian Santa Ornament, De Carlini Irish Santa Ornament and De Carlini Usa Santa Ornament. De Carlini Santa with Stocking and Garland Ornament.